Guest author, Holly Henry, PhD, is a Program Officer at the Lucile Packard Foundation for Children’s Health. She works to improve the system of care for children with special health care needs. Dr. Henry focuses on promoting effective care coordination, a practice that links children and their families with appropriate services and resources to support optimal health. Every child deserves high quality health care that is accessible, family-centered, culturally competent, coordinated, continuous, compassionate, and comprehensive. Unfortunately, our current system of care for children is deeply fragmented and health needs are not being met. One approach to strengthening coordination of care is providing care through a medical home. The medical home recognizes the family as a constant in a child’s life and emphasizes partnership between health care professionals and families. It facilitates collaboration between patients, clinicians, medical staff, and families. More importantly, a medical home extends beyond the four walls of a clinical practice – it includes specialty care, educational services, and family support. In 2016, 42% of California children received care within a medical home compared with 49% of children nationally. Receipt of care within a medical home varies across the state. 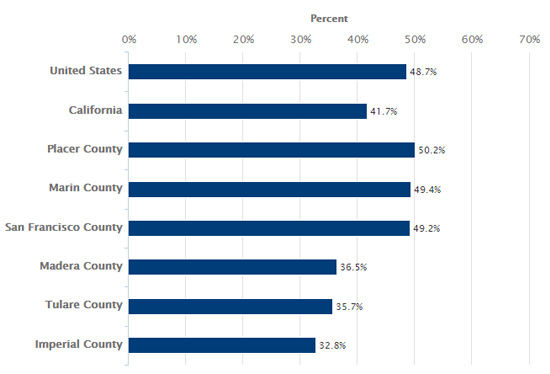 The counties with the highest and lowest percentages of children receiving care within a medical home, among counties with data, are also noted in the graph above. Children receiving care from a medical home have fewer outpatient visits and families report better child health status. Families also report increased satisfaction with their child’s care. For children with special health care needs this can also mean decreased length and frequency of hospitalizations and lower out-of-pocket spending. All children would benefit from being cared for within a medical home. See how your county is faring. Learn more about care coordination and how it can help reduce health care fragmentation. The Lucile Packard Foundation is hosting a webinar on care coordination for children with medical complexity on July 26 at 10 am PST. Audience Q&A is highly encouraged. Attendees can listen via web or phone. Learn more and register. This entry was posted on Wednesday, July 18th, 2018 at 11:52 am. You can follow any responses to this entry through the RSS 2.0 feed. You can leave a response, or trackback from your own site.